The K12 education system in Japan is fairly famous around the world, and is often held up as the standard of East Asian education. But how does it work, and what kind of classes are taught? Like in America, the Japanese school system is based on age. Children usually go to some sort of preparatory day care until they are six, in which they enroll in a kindergarten. 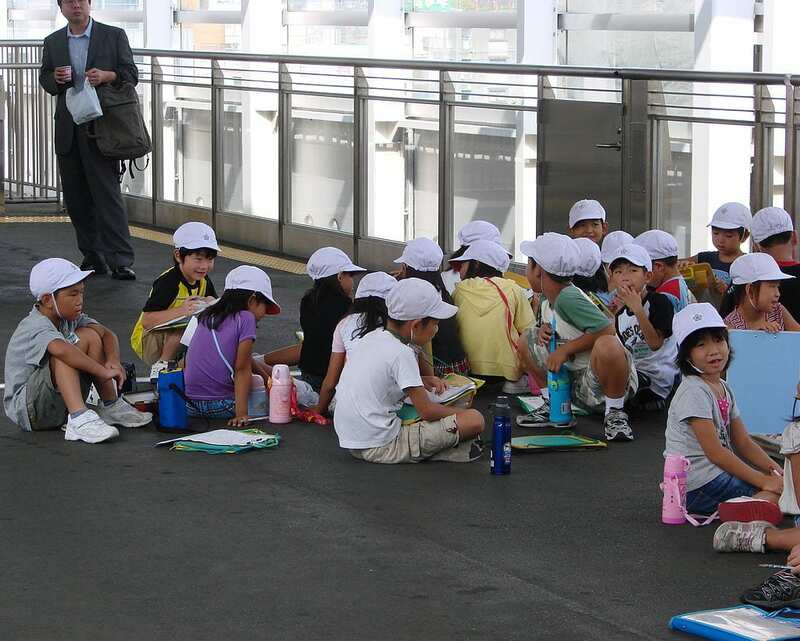 These kindergartens are not offered through elementary schools like they are in America. Instead they are their own schools, usually with large playgrounds and colorful murals on the side. Children in kindergarten learn much of what American kindergartners learn, except instead of English they learn basic Japanese symbols to give them a jump-start in elementary school. Elementary school lasts from first to sixth grade, or 7 – 12. Elementary schools may or may not require a uniform, but all children usually wear a yellow hat and a red backpack for girls or a black backpack for boys. Children learn the basics of reading and writing (in Japanese and usually English,) math, science, music, calligraphy, history, and geography. They also have regular PE classes. Middle school is from seventh to ninth grade, or 13 – 15. This is when uniforms become mandatory. Students begin joining clubs in sports, arts, and sciences, and take many of the same courses that they did before. Only now it’s at a much harder levels, and classes are usually split by perceived intelligence. High school is from tenth to twelfth grade, or 16 – 18, and is not mandatory, although a vast majority of Japanese people attend. High school is considered the most difficult part of Japanese schooling, including college. Students sometimes only get four hours of sleep as they take advanced classes and attend up to three hours of tutoring every day after school. When a student graduates high school, he or she is expected to know over 2,000 Japanese characters. The K12 education system in Japan is year-round, beginning in early April and lasting until mid-March. There is usually a month off in August, the hottest month of the year, and breaks for New Year’s and in between academic years. Japanese schools may be public or private, although public school also has tuition costs. Public schools are all on the same curriculum at any time of year, meaning students who have to transfer do not miss core materials. Private schools may have their own lesson plans. Unlike in America, students do not change classrooms throughout the day. Instead teachers do. Grades are separated into numbered groups, and each group has their own homeroom that the teachers come to. The exception is for science labs, PE, music, and sometimes home ec and art. The K12 education system in Japan is most famous for its entrance exams. Each university, high school, and even some middle and elementary schools have their own exams that students must pass in order to qualify for attendance. Students will study for years in order to pass these exams. This means that there is a hierarchy of schools in every town, and the private schools are not always the best. Sometimes private schools exist just to give less academically inclined students a chance to get a degree. As you can see, the school system in Japan is quitedifferent from that in America. However, it is not difficult to understand, and is really quite fascinating.